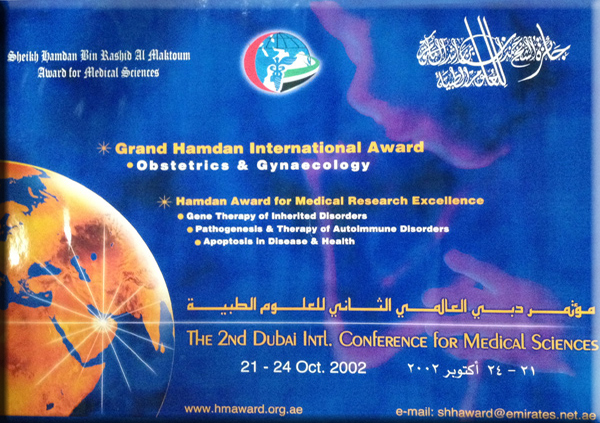 The topics of the 2nd term, 2001-2002 were selected to be for Grand Hamdan International Award - Obstetrics & Gynecology, and for Hamdan Award for Medical Research Excellence - Gene Therapy of Inherited Disorders, Pathogenesis and Therapy of Autoimmune Disorders, Apoptosis in Disease & Health. Infertility is probably the single most common ailment to afflict men and women of reproductive age. It has been estimated that the level of infertility in the community is probably one out of every 7 couples of reproductive age. Infertility is a major public health problem. Data from the United States show that it affects 7.1 percent, or 2.1 million married couples. The same data show that 6.2 million women aged 15-44 have some degree of impaired fecundity; of these 2.7 million have sought medical help. Categorizing human infertility is not an exact science, but it is generally attributed to many factors. In many cases, however, treatment is empirical. In recent years, assisted reproductive technologies (ART) have rapidly expanded the possibilities of infertility treatment, but many questions remain, not the least of which is the inherent potential to transmit chromosomal aberrations that in themselves may have been responsible for fertility failure. This award is designed to recognize the contributions of scientists who have pioneered research, in the basic science or clinical research, on the diagnosis, prevention, and treatment of infertility. The discovery of restriction enzymes that splice DNA at specific sequences enabled researchers to cut, remove and join genes together, and to start understanding the important roles that genetic factors play in disease. Currently, the Human Genome Project nears completion, providing new links between particular genes and diseases. Originally known as 'genetic replacement therapy' during the early 1980s, 'gene therapy' has now outgrown its original definition and is applied to all manner of protocols that involve an element of gene transfer, either in vivo or ex vivo. The development of serious and distressing inherited genetic diseases could be prevented before birth and eliminated in subsequent generations. Gene therapy offers much hope for the future treatment of a variety of clinical conditions. The body has devised ways, collectively called immunological tolerance, of avoiding immune responses against itself. Autoimmunity is an immune response against components of self and therefore is a failure of tolerance. Autoimmune diseases are those in which either antibodies or T lymphocytes reactive against auto antigens are involved in their pathogenesis. The aim of the treatment of autoimmune disease is to suppress the inappropriate autoimmune responses. Non-specific immunosuppressive therapy, however, compromises the patient’s defence against infections. Efforts are therefore being made to develop more specific methods. The understanding of pathogenesis and the development of new therapies for autoimmune disorders are of great importance for a broad range of human diseases affecting a large number of patients in developed and developing countries. Apoptosis is programmed cell death. An organism uses cell death in a very positive way to sculpt its development; to arrange for rapid expansion and subsequent contraction of a cell population, and to defend itself by destroying cells that are infected or attacked. To do so, cells and organisms constantly monitor signals given and received by cells. An incorrect or confused response means cell death or the survival of an abnormal cell. This high security surveillance is a wise choice, for the goal of the attacker may be to preserve the cell it is attacking and to use the cell for its own purposes. The bulk of research into apoptosis has looked at death and survival signals. Many of these fit a pattern in which infectious pathological agents or potentially malignant cells attempt to stave off death (anti-apoptotic genes) while the organism tries to spot these dangers and invokes cell suicide (pro-apoptotic genes). Occasionally these battles, as in any war, affect civilian territory, and, for example, in AIDS and autoimmune diseases, bystander cells die. A highly complex signaling mechanism is used to generate a subtle distinction between a growth response and a death response. Thus knowledge about apoptosis is very important in cancer, brain cell death, infections and many other conditions affecting humans. Professor Bob Edwards was born in Leeds, United Kingdom on 27th September 1925. He was educated in Manchester Central High School between 1936-1944. He then served in the British Army and was based in Palestine, Jordan and Egypt. He gained his BSc from the University of Bangor, Wales in 1951. Prof. W. French Anderson, born in 1936, an American by nationality, is the Director of the Gene Therapy Laboratories at the University of Southern California Keck School of Medicine, where he also serves as Professor of Biochemistry and Pediatrics, is a Full Member of the Norris Comprehensive Cancer Center, and is the Program Coordinator for Gene Therapy in the Institute of Genetic Medicine. Professor Foo Yew Liew was born in 1943 in Malaysia but has a British nationality. He graduated and obtained his PhD from Australia. He is renowned for his contribution to the concept of T cell subsets and their role in infection and autoimmune diseases. He is Gardiner Professor of Immunology at the University of Glasgow, UK. Prof. Lernmark, born in 1945, a Swedish national, received his Doctor of Medicine (Ph.D.) from the University of Umea, Umea, Sweden in 1972. He was appointed associate professor in Histology in 1972 and has since held faculty positions at the University of Chicago (1974-75, 1977-78), the University of Lund, Lund, Sweden (1980-91), and the Karolinska Institute, Stockholm, Sweden (1993-1994) where he was Professor of Experimental Endocrinology. Prof. Martin Raff is a world leader in Molecular Cell Biology. He is professor of biology at the London University and is the president of British Society of Cell Biology, Chairman of UK Life Sciences Committee. He received his medical degree from McGill University in the year 1963. Early in 1997, the Al Maktoum Charity Foundation launched its humanitarian move through the cultural center that had been established in Dublin, Ireland. Palestinian by nationality, Lebanese by birth, and Syrian by residence, Dr.Ghassan Bin Mohamed Shahroor had graduated from the Faculty of Medicine, Damascus University in 1979. Four years later he became a specialist in head, neck and ear medicine and surgery. William P. Magee Jr., D.D.S., M.D., a leading plastic and craniofacial surgeon, founded Operation Smile in 1982 with his wife, Kathleen S. Magee, B.S.N., M.Ed., M.S.W. 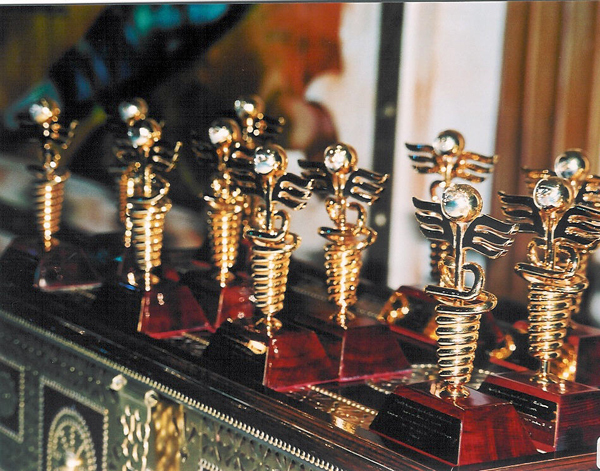 Dr. Shardkumar Dicksheet., was born in Pandharpur, Maharashtra, India on December 13,1930. He spent the first two years of his life in the town of Chandrapur where his father was Post Master. In 1932, his father was transferred to Varoda where he lived until 1935 and then moved to Wardha. At the age of 13, Dr. Dicksheet passed the Sangeet Visharad Examination and received a Bachelor of Music from Bhatkhande University. Dr. Dicksheet graduated from high school with distinction in five subjects, and at the matriculation examination, Dr. Dicksheet ranked among the top ten students in the state. The Faculty of Medicine, University of Gezira was established in 1975. It is situated in Wad Medani, the Capital of Gezira State. Though the Faculty of Medicine was established in 1975 the first batch of students was enrolled in 1978 and it is the second oldest medical college in Sudan. Established with the rise of the Union in 1971, the Ministry of Health was in dire need of distinguished national cadres, and Dr. Saud Kayed Al-Qassimi was one of these. In Dubai she was born in 1935, and to Dubai she had returned in 1964 as the first national woman doctor. Born in Al-Ain in 1938, Sulaiman Ahmad Al-Houqani learned and recited the Quoran at the age of nine. The quest for knowledge and learning took him to Kenya where he gained in 1954 a certificate qualifying him as an assistant physician and drug composer. He later worked in Saudi Arabia, and then in Qatar. 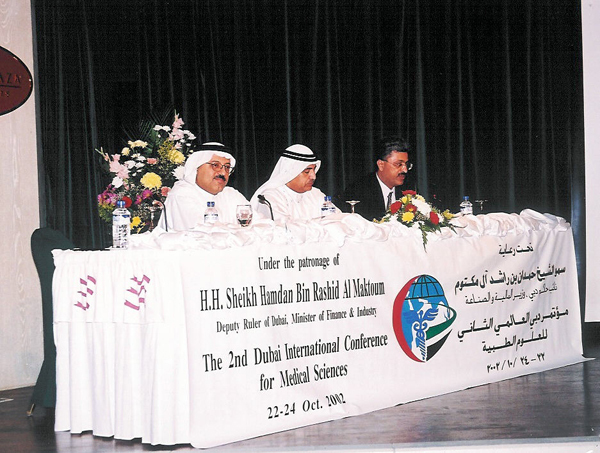 Born in Dubai in 1942, Dr Sayed Jaafar Mohamed had received his pre-university education in the emirate, ultimately obtaining the High School Certificate in 1963. He them headed for Egypt where he studied medicine. In 1970 he obtained his MBBS. Two years later, he had completed the internship year and a diploma. Born in Dubai in 1945, Fareed Al-Gurq was the first UAE national to head for Britain following the establishment of the union state, having received a grant from H.H. the late Sheikh Rashid Bin Said Al-Maktoum, then Ruler of Dubai. Dr. Chris Howarth was born in Cambridge, UK in 1067. His father Professor Frank Howarth, an airly pioneer of the integrated organ-system approach to medical education, established several Medical Schools in different parts of the world Including Ethiopia, Jordan, Nigeria and Yemen between the 1080'S and 1080's. In the late 80's he returned to the UK to begin his second career in science. Dr. Jaffar Ali is by birth an Indian, holding a Malaysian nationality, and obtained a PhD in Mammalian Preimpiantation Embryo Culture and Cryopreservation from the Australian National University. He also holds a masters degree in Biochemistry. He started his career m science in the year 1980 at the Reproductive Research Centre (RRC) of the National Population and Family Development Board, Prima Minister s Department, Government of Malaysia.